What Type of Rocks Are River Rocks? The term "river rock" refers to a diverse group of rocks that have been worn and rounded by the action of moving water. River rocks are most often found on beaches and in stream beds and can come in a range of sizes, colors and textures. River rocks have many common applications, including as landscaping, decorative ground covers and construction material for wall facades and walkways and for use in interior design projects and in wellness applications such as hot stone massages. River rocks are smoothed by exposure to moving water. Polished granite lends a classy look to a kitchen counter top. 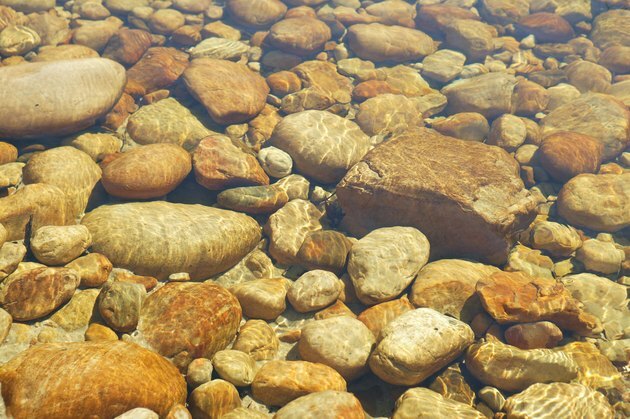 The most common river rocks used in landscaping and decorative construction are made of granite. Granite belongs to the "intrusive" category of igneous rock, which means it formed below the earth's surface as magma slowly cooled and crystallized. Granite river rocks can have a speckled or banded appearance due to the coarse grains of minerals, usually quartz and feldspar, that form the granite composite. This composite nature results in a huge variance in coloration, with hues ranging from gray and black to white, green, purple and russet. Because basalt retains heat well, it is often used for hot stone massages. Basalt is an extrusive rock, meaning it formed when lava cooled above the surface of the earth's crust. Basalt has a fine grain and ranges in color from dark green to grayish black. 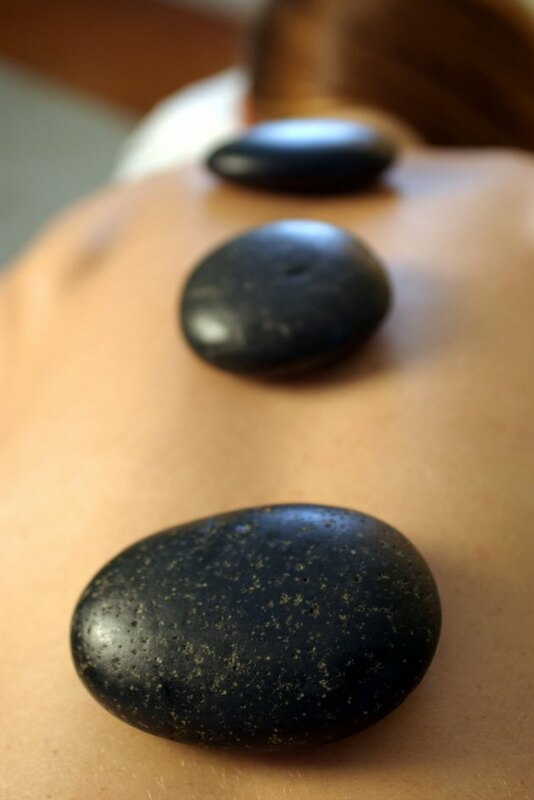 Basalt river rocks are the most frequently used stone in hot stone massages because of their ability to retain heat. Smaller basalt river rocks and pebbles are often used as filler for flower arrangements, candle holders and meditation fountains because their smooth, dark appearance lends a sophisticated look. 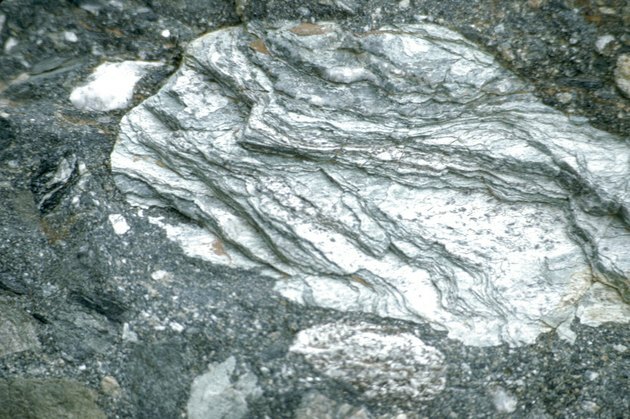 Schist has a foliated or banded appearance. Schist is a foliated metamorphic rock that formed deep within the earth as a result of exposure to extreme heat and pressure. The foliated quality of schist refers to the banded appearance of the rock. Schist river rocks come in a range of gray shades and tend to be rectangular in shape, with somewhat smoothed edges. Used in landscaping, schist river rocks can lend a natural and untamed feel to the environment. 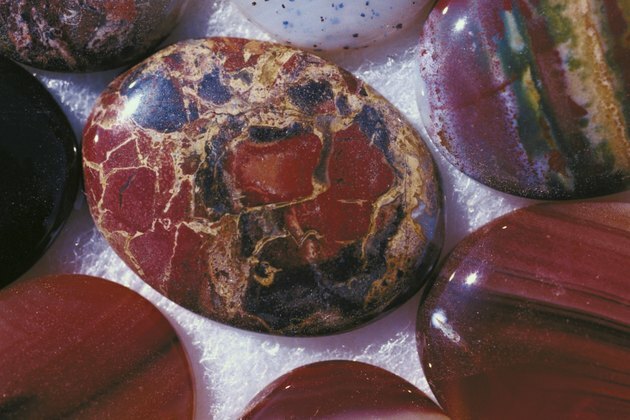 Rocks that have been polished in a tumbler end up with a smooth, glossy surface. Polished and manufactured river rocks do not occur in nature. Polished river rocks are smaller river rocks that have been tumbled in a rock tumbler with a series of increasingly finer grades of polishing powder until they reach a glossy finish. 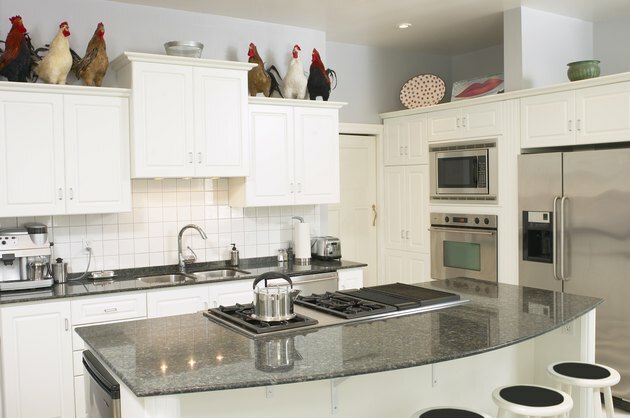 Polishing can bring out the speckles, striations and color variations that occur naturally in river rocks and are a stylish choice for interior decorating projects. Manufactured river rocks consist of quarried natural stone that has been artificially resurfaced on one side to resemble river rock and cut flat on the other side. These are generally used in construction as a finish for exterior and interior walls: the flat side of the rock adheres easily to a wall base, while the shaped river rock surface gives the wall a natural, organic beauty.